The 2nd day of the O.M Match Race is over. The good weather helped us to finish the Round Robin very early. 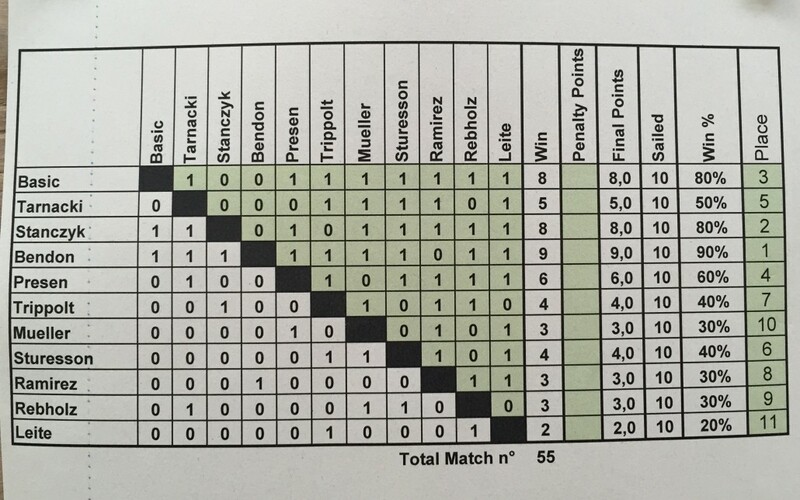 The actual scoring isn’t confirming the ranking list position having Stanczyk following Bendon with Basic and Presen in 3rd and 4th position. Tomorrow semifinals and finals will be done and a consolation series will be done from 8th to 5th in “King of the Caste” format. Weather forecast for tomorrow is giving good chance to have good weather and wind from the early morning. We received many congrats in these days either for racing or for the life at Club…. Cara Paola, Devo scriverti per dire grazie per la settimana scorsa. Ledro e stato il luogo piu accogliente che io ho passato nella mia esperienza di vela internazionale. La tua comunita e unica e speciale. Spero che tutta vada bene questa settimana per il secondo campionato. Anche spero vederti l’anno prossimo! I migliori auguri, Jane.